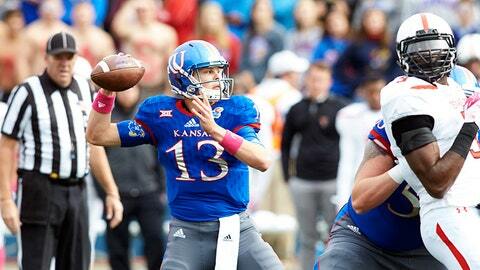 KU freshman quarterback Ryan Willis will make his third straight start. STILLWATER, Okla. — The players and coaches for No. 14 Oklahoma State are saying all the right things with winless Kansas in town. "We’re going to prepare to the best of our ability, we don’t ever overlook anyone," said Cowboys quarterback Mason Rudolph. "We respect our opponent, and we’re going to prepare like we did for Texas, Kansas State and everyone we’ve played this year." On paper, the Cowboys (6-0, 3-0 Big 12) are heavy favorites when they face the Jayhawks (0-6, 0-3) at home on Saturday. But Oklahoma State has won its three conference games by a total of 12 points and needed overtime against West Virginia. The Cowboys can also use the Jayhawks’ game last weekend with Texas Tech as a cautionary tale. Trailing 20-0 at halftime, Kansas pulled to within 23-20 before Tech’s Jah’Shawn Johnson returned an interception for a touchdown with 4:07 remaining to snuff the comeback bid. "Each week, we have to focus and prepare, because we’re not good enough to just show up, and we have areas that we need to improve in," said Oklahoma State coach Mike Gundy. "Last week is a good example. It was a pretty close game against a Tech team that’s rolled up some big numbers this year. That helps to stress the importance of preparation." Lookin’ good! Check out our gallery of Big 12 football cheerleaders. Kansas coach David Beaty was encouraged by his team’s effort against the Red Raiders, and believes that near-success will fuel his players this week. "I believe the positives that they saw are some things that keep those guys practicing hard week-in and week-out," Beaty said. "We had a real shot to go take that one and we weren’t able to do it. Our guys were very disappointed in that. I think they’re hungry to get back on the field." FIRST DOWN AND OUT: Oklahoma State is looking for improvement on first-down plays. Over their three Big 12 games, the Cowboys averaged 3.1 yards per play on first down, and just 2.5 yards per first down in their last outing, a 33-26 overtime win over West Virginia on Oct. 10. JUST FOR KICKS: After missing three field goals and an extra point last week against Texas Tech, Kansas needs to step up its kicking game. The Jayhawks have used two place-kickers all year, and each has struggled. Matthew Wyman missed attempts from 52 and 34 yards as well as an extra point, while Nick Bartolotta shanked a 22-yarder. Including Bartolotta’s missed 44-yard attempt two weeks earlier against Iowa State, KU is 0 for 4 on field-goal tries over the last three contests. "Our team believes in those guys, and those guys are going to come back and be productive for us," Beaty said. "It’s just a matter of getting focused, concentrating and utilizing your technique." FIRST-ROUND TALENT: Oklahoma State junior defensive end Emmanuel Ogbah is being touted as a likely first-round pick if he declares for the NFL Draft next spring. Ogbah leads the Big 12 and is tied for fifth in the nation with 7 1/2 sacks, and his 11 tackles for loss is tied for 10th in the country. Ogbah forced two fumbles, recovering one in the end zone for a touchdown, and recorded a season-high eight tackles against West Virginia to earn Big 12 Defensive Player of the Week honors. "We’re lucky that we have him," Gundy said. "I couldn’t be any more pleased with the way that he’s handled himself and the leadership he brings to the team." LEARNING ON THE FLY: Kansas freshman quarterback Ryan Willis will make his third straight start. Thrust into action after injuries to Montell Cozart and Deondre Ford, Willis has improved each time out. Last week against Texas Tech, he completed 35 of 50 passes for 330 yards and two touchdowns, along with one interception. "I think Ryan’s done a nice job taking advantage of this opportunity," Beaty said. "He brings some things to the table that we weren’t, quite honestly, doing before he got in there." START ME UP: One of the keys for Oklahoma State has been getting off to quick starts. The Cowboys have scored first in five of their six games this season, and in the only one that they didn’t, Oct. 3 against Kansas State, it was because K-State got the ball first and scored, with OSU tying it on the subsequent possession.